I work for a great company, don’t all questions start this way? Lately, we’ve been having a lot of conversations about perception. It’s such a difficult thing to predict or change. How do you change perceptions of those you lead? Also, how do you coach those you lead, to work around perceptions that may be holding back their personal growth and development? One of the great frustrations of leadership is feeling one way on the inside and being perceived another way by others. We all want to be known and accepted for who we really are. Strong aggressive leaders are cold hearted. Leaders who lead from the back are passive or lack courage. In order to feel like we belong in a role or organization, we must feel seen, understood, and respected for who we are. The greater the disconnect between what’s on the inside and external perceptions, the deeper our disappointment, frustration, and lack of fulfillment. The journey always begins with you. You can influence others – you can’t change them. #1. Determine how you want to be perceived as a leader. Reflect on your personality, talent, and strengths. What do they suggest? Don’t get lost in what others expect. 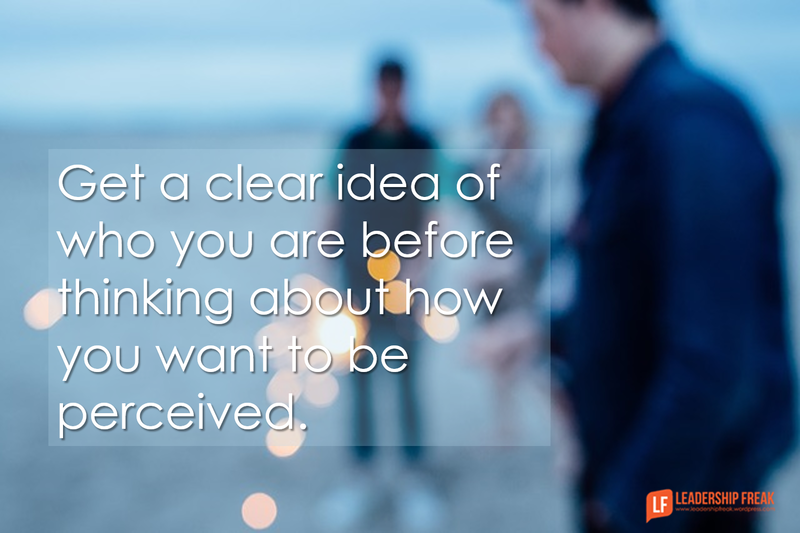 Get a clear idea of who you are before thinking about how you want to be perceived. #2. Accept yourself and commit to develop yourself. Avoid the easy way out, when it comes to growth. You might be tempted to rule out something because it feels awkward. Give new behaviors a try, as long as they don’t clearly violate your values. #3. Practice transparency with your team. Declare what’s in your heart. Tell them what you really want. When leaders practice transparency, it often opens the hearts of others. #4. Turn to the future, not the past, when you declare your heart. Focus on aspiration, more than frustration. #5. Identify a mentor. Look for a leader who is perceived by others in ways that match your aspirations. #6. Reject ambiguity. Adopt specific behaviors that impact the perception of others. #7. Include key players. Don’t tell everyone what’s going on. Share the journey with a few trusted colleagues. Don’t lose yourself to the expectations of others. Never place external expectations above personal values. For example, experienced leaders may want you to emulate their style. After all, it worked for them, it will work for you. The stronger the leaders on your team, the more pressure they may exert. Thank them for their suggestion. Explore the goals they are trying to achieve. Embrace their goals, as long as they are ethical and align with organizational goals. Reject their strategies, if you are certain they don’t align with who you are. When in doubt, test drive their suggestions and evaluate. Discuss alternative behavior-based strategies that achieve their goals. Discuss results. How did new behaviors work? Did you have a growing sense of authenticity? It’s worth it to give this some time. Changing established perceptions is extremely difficult. Identify how you want to show up. The second part of your email is about helping others with misperceptions. I suggest a 360 degree assessment. We often need to see how others see us, in order to see ourselves more clearly. You might try a 360 as part of your journey as well. How might leaders change the misperceptions of others? So many short one-liners come to mind, as I read the post. “Never try to teach a pig to sing. It wastes your time and simply annoys the pig.” — there are some people that you simply cannot align or with whom you cannot build trust. Keep communicating. Keep involving and engaging. Work is NOT a democracy but you can ask and use other people’s thoughts, suggestions and ideas. Teamwork is NOT the total answer but it can help build accountability and shared goals. Dan’s list is a good one, with LOTS of useful stuff. Keep perspective. and Don’t sweat the little stuff. Confront and address (positively) the behaviors that do not support the overall mission, vision, goals, measures and expectations. Spectator Sheep (the ones who go Naaaaaaaa Baaaaaaaa all the time) are okay, since they CAN offer a different and useful perspective on things. But Jump IN with both feet if that verbal stuff shifts into sabotage. (The US Gov published a useful brochure back in 1940s with tips and frameworks to effectively sabotage foreign invaders, like the French were actually doing pretty well — I blogged a while back about how that shows up in the workplace. Negative perspectives are okay but deviant behavior needs to be addressed before it turns things downhill. Well, that is my Saturday morning brain dump on all things alignment. Oh, remember to have FUN out there, too! Love the thread of value-alignment and inner transformation that runs through this installment. 2. Make sure you want to show up that way for your own greater wellbeing and the wellbeing of others over time. Any other reason will feel like an equation, or putting on someone else’s style of clothing. 3. Become that. In my experience, everything changes when we do. I also like tactical approaches you include in your lists. The ones that fit us, and how authentically they feel to others in their implementation, is of course affected by how aligned and authentic we are when it comes to our self-leadership. Examples: I’ve known quiet leaders who inspired by just walking into a room; loud leaders who didn’t offend, because their good natures and empathy shined through their bluster; and amazingly efficient, seemingly type A leaders who could and would stop on a dime to help you feel like you could do anything. It begins with relationship with self, and moves out to others. I appreciate that you are stimulating a discussion of approaches to both. Address the mis-perception one-on-one either in the moment, if you are alone, or shortly after the moment if you are in a group. This sounds easier than it is. This means you need to be open to the possibility of some feedback that may not be pleasant. If you react with some emotions that are not healthy to preserving a healthy relationship with the person, then you need to catch yourself before you say something you will regret later. You may find out that it was not mis-perception after all but something you did for which you genuinely need to extend an apology. If it is mis-perception, then the authors of Crucial Conversations offer several easy-to-remember tools to do this. For example, you can use contrasting in which you state what you don’t want to do followed by what you do want to do.